A little shadow box work. 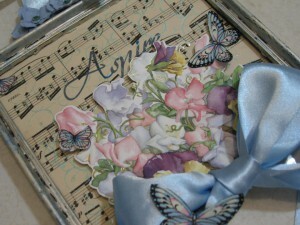 Oh I love this shadow box- beautiful! This is my first time to your blog – you are such a lovely artist! Your blog header is gorgeous. I LOVE YOUR BLOG BANNER!!!! And the shadow box is to die for. Wow, it turned out breathtakingly!! So very pretty!! This is just gorgeous! I love the colors and all the little details. WOW this is beautiful! I hopped over from Flip Flop Mom blog! Lovely! And tell me, your title banner, is it from a collage you made? It’s so pretty!